You may not believe it but this gory indcident happened right infront of the bystanders in full day light - and no one helped. 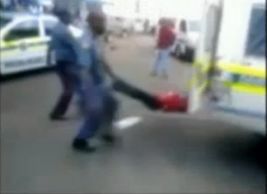 A video footage taken by a bystander shows a 27 old Mozambican taxi driver, allegedly handcuffed to the back of a police van and dragged through the streets in Daveyton, east of Johannesburg. The video shows a large crowd gathering, as uniformed policemen tie him to a van, dragging him as they drive away. Two policemen are seen holding the dragged driver by his feet - but when the van sped, they left him being dragged on the road. He was later taken into custody, where he died, local media report. The driver was only accused of parking his vehicle incorrectly.